If you are like many individuals, you probably aren’t aware of the REAL ID Act or how it affects you. While more than half of the United States is REAL ID compliant, there are many states that are still not REAL ID compliant due to extensions granted by the Secretary of Homeland Security. 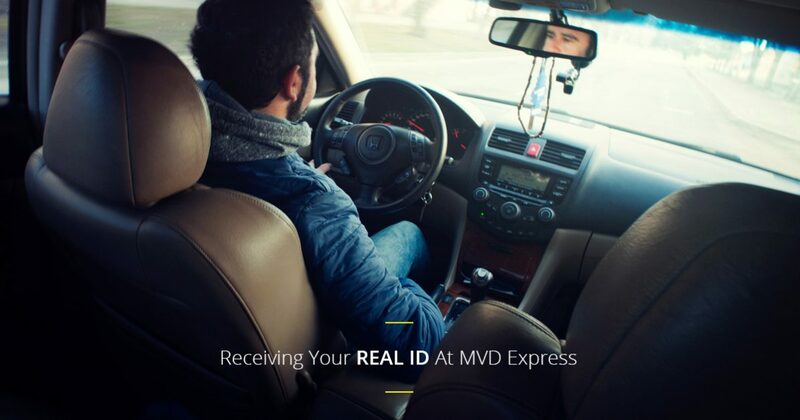 In today’s article, we will be taking a look at some of the required documents that you will need when applying for your REAL ID, and why you should apply for your REAL ID at MVD Express. Are you searching for the fastest and most convenient services for your motor-vehicle needs? If so, look no further than MVD Express! With 10 unique locations throughout New Mexico, we make it simple for you to find an MVD Express in your area. In fact, those that schedule an appointment online with MVD Express rarely have to wait longer than 15 minutes at any given location. Learn how you can apply for a REAL ID today by continuing to read more below. Why Do I Need A REAL ID? There are many reasons why you will need a REAL ID, but the most important reason is that it is a requirement if you wish to operate a motor vehicle. Not only does a REAL ID allow you to legally operate a motor vehicle, it is also necessary if you wish to board a commercial aircraft or enter a federal facility. Below, you will be able to learn more about the acceptable documents that you will be required to present while applying for your REAL ID. The first document that you will be required to present is one proof of your identification number. This information can be presented in a number of ways such as a W-2 form, an SSA-1099 or Non-SSA-1099 form, a Social Security Card, or a pay stub that clearly shows your Social Security Number and name. Along with a proof of your identification number, you must also present one proof of identity and age. Your proof of identity and age can be presented in the form of a valid US Passport or Passport Card, a Foreign Passport possessing an I-551 stamp, a Certificate of Citizenship issued by DHS, an original or certified copy of your Birth Certificate, and many other forms that can be found on our REAL ID Documentation Requirements page. 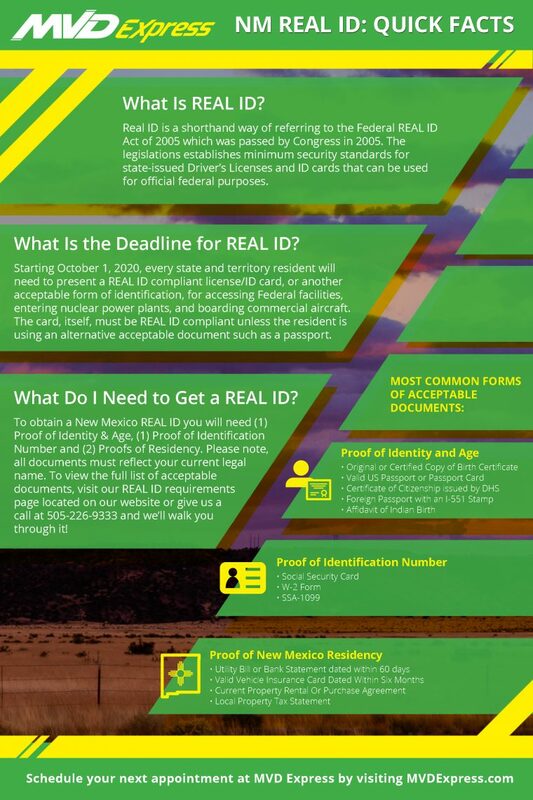 Lastly, after you have compiled your proof of identification number, as well as your proof of identity and age, you must also possess two proofs of New Mexico Residency. There are a number of ways that you can verify your proof of New Mexico Residency, but the most commonly used documents include a local property tax statement, a property rental or purchase agreement, an insurance bill dated within six months, or a bank statement dated within 60 days. There are, however, many other acceptable forms of documentation not listed in this article. If you have any additional questions or concerns about applying for a REAL ID, don’t hesitate to get in touch with our friendly staff at MVD Express. We look forward to speaking with you!